One of the first things you notice when you arrive in Accra's Kotoka International Airport is a huge red sign that reads: "Welcome to Ghana, the Gateway to Africa." I quickly discovered on my recent visit to this West African nation that this is not an idle boast. Not only is it practically true -- the airport is served by direct flights from many cities in the world, including Washington, D.C. -- but as I left the airport I quickly found myself amidst all the outward signs of what is a burgeoning economy. Some recent reports have suggested that Ghana was the fastest growing economy of 2011, with reports of over 20 percent growth. Everywhere in and around Accra there are visible signs of this explosive growth. Multiple hotels are under construction to accommodate the rising number of foreign business visitors. Huge, glass office towers have sprung up in the middle of fields and there is business construction everywhere you go. 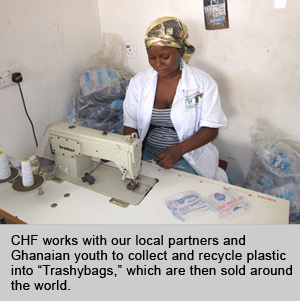 Our CHF International staff in Ghana, and those of our local partner organizations, mostly young Ghanaians, are emblematic of the growing middle classes -- smart, well educated and enthusiastic, with a commitment to improving conditions in their own country and communities. To say the people in Ghana are tremendously friendly is an understatement; everywhere I went I was greeted by beaming faces and infectious smiles. According to the research of the recent Gallup and Meridian International Center U.S. Global Leadership Project, Ghana is the country in the world with the most positive view of the United States, with a 92 percent approval rating. Ghana is, indeed, a gateway to Africa and a very visible symbol of the emerging economies of that great changing continent. Its combination of rapid economic growth and a large population makes it an emerging consumer market for private sector investment. As a welcoming country that is embracing the future, Ghana is well positioned for such future investment. Of course, with this huge growth come challenges. Ghana is one of the most rapidly urbanizing countries in the world. Half of its 24 million people now live in cities and this population is urbanizing at 3.4 percent a year, triple the rate of population growth. Naturally, much of this urban growth is taking place in informal settlements and one-third of the population lacks access to municipal services such as water, sanitation and sewage removal. That is where we at CHF International are focusing our attention. We are working with the United States Agency for International Development to extend the reach of water and sanitation services into slum communities, and with the Bill & Melinda Gates Foundation to encourage sustainable growth in youth employment, particularly in the waste management and recycling industries. Most recently we began a program with the Bill & Melinda Gates Foundation that is working to create systems for improving revenue collection for the local government to pay for much-needed public services. We also work with a local bank, HFC Bank, to provide essential credit to entrepreneurs and home-buyers, often providing microloans to slum dwellers to start up their own small businesses. With these and other partnerships in the local community, we can work to assist the slum populations to fully participate in the benefits that Ghana is experiencing from its economic growth. The Ghanaian people are rightly optimistic about their future, and that optimism can be felt throughout all levels of the country and its communities. It is a country on the move and a place to watch in the future.